Peter Lehmann Princess Moscato 2009 – 500ml – up to $18 – ** – Red frontignac, carbonated, low (7.5%) alcohol. Faintest onion skin tinge of colour. Pleasing raisiny nose and palate in a mid-sweet, spritzy style. 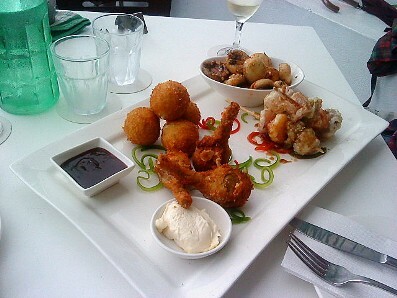 iS Tapas Bar (249 Gympie Terrace, Noosaville, Queensland, 07 5447 1818). In usually sunny Noosaville it was gusty and alternately raining and shining, looking for a light lunch we stopped at the open-fronted iS Tapas Bar and were given a table with views of the Noosa River. iS is fully licensed but allows patrons to bring their own wine ($4 corkage fee per bottle) and we took along a 2003 Petaluma Hanlin Hill Riesling. Despite its rather warm cellaring in our house it was in excellent condition – sprightly and lemony with just an occasional hint of that aged riesling character that we all know and love yet find hard to describe without annoying winemakers. From the longish menu we chose Chili mushrooms – in a light sauce/marinade of butter, lemon juice, chili, garlic and finely chopped herebs; Parmesan crumbed artichokes – these were served with the stems (quite edible) attached and looked a little like chicken drumsticks – served with a truffle and lime mayonnaise; Manchego cheese croquettes – crumbed, about the size of pool balls – with a quince paste sauce, and Tempura vegetables on skewers -tiny morsels of crisp veg in the lightest of batter. 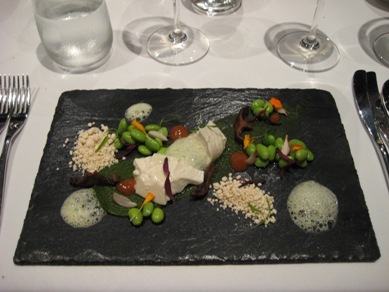 The food presentaion was attractive, the waiter was hip and we really enjoyed each dish. The bill for two, including corkage, totalled $42. The latest edition of glossy mag Spain Gourmetour arrived recently and I tucked in a napkin to catch the saliva as I read it through. If ever there was a food and wine magazine with high production values this is it. Even the ad photos look good enough to eat. Among the classy articles about Spanish food, wine and travel, you will find recipes reflecting Spain as a world leader in avant garde cuisine. I’ve fiddled successfully with recipes in the latest issue: the dessert, ‘Mango, papaya, citrus fruits and orange blossom honey jelly’ was stunning. Spain Gourmetour is published three times a year. Best of all, it’s free to professionals in the wine and food industry. To request a subscription, simply email your details and postal address with the subject line ‘Spain Gourmetour’ to the Economic and Commercial Offices of the Spanish Embassy in your country. For email addresses see Spain Gourmetour site. This is a full-strength – 4.5% alcohol – beer sold in clear glass 355ml stubbies. A very different style from Coopers Sparkling Ale but quite enjoyable for all that. Lightish amber in colour with a pleasing malty nose. Surprisingly full-bodied in the mouth with the malt continuing to a dryish finish.